There are 20 blog entries for July 2010. Thursday, July 29th, 2010 at 3:02pm. Thursday, July 29th, 2010 at 12:13pm. NEW YORK — Mortgage rates dropped to the lowest level on record for the fifth time in six weeks, making homebuying and refinancing the most attractive in decades for those who can get loans. The average rate for 30-year fixed loans this week was 4.54%, down from 4.56 last week, mortgage company Freddie Mac said Thursday. That's the lowest since Freddie Mac began tracking rates in 1971. The last time rates were lower was during the 1950s, when most mortgages lasted just 20 or 25 years. The rate on the 15-year fixed loan dropped to 4%, down from 4.03% last week and the lowest on record. Wednesday, July 28th, 2010 at 10:36am. Home sales and prices were up in the first half of the year in most Dallas-area residential districts. The big question is: Will it last? Some real estate agents who pound the streets representing buyers and sellers say business is still pretty good – even without the federal tax credits that fueled so much homebuying earlier this year. "I'm written a ton of contracts in the past 2 ½ weeks," said Scott Schueler of Keller Williams Realty. "The bulk of my business right now is first-time buyers." Tuesday, July 27th, 2010 at 12:57pm. 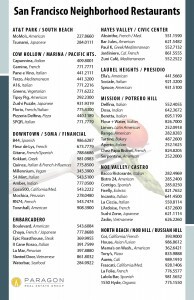 While not all inclusive, here is a handy guide to making reservations at local restaurants in your neighborhood. Tuesday, July 27th, 2010 at 11:28am. Topic: Hawaii, U.S., and global economic factors that affect the Hawaii residential real estate market. Topic: U.S. real estate markets compared to Hawaii - - How are we faring? Topic: Bill gives his unique take on the Hawaii Real Estate Market. Click here to view the event presentation slides for State of Hawaii Real Estate. Monday, July 26th, 2010 at 12:53pm. $1,100,000 // Marina // Divisadero BR/BA: 2/2 PKG: 1 Brief Description: Top floor, corner condo with views of Pac Height & Presidio. 10-unit contemporary building with elevator. Great location. Monday, July 26th, 2010 at 12:52pm. (Editor’s Note: Appearing below is the press release accompanying the Association’s Market Focus report for June. The report can be viewed by clicking on the link below the press release. A report is issued each month jointly by Rosen Consulting Group and the Association. The reports are intended to provide the media and REALTOR® members of the Association with monthly analyses of the state of the local economy and the housing and mortgage markets. Monday, July 26th, 2010 at 12:51pm. These are for San Francisco SFDs, condos, TICs & 2-4 unit buildings, by week over the past 6 months, through July 18, 2010. Friday, July 23rd, 2010 at 9:01am. FORT WORTH — There is yet another reason to be proud of the uniquely western feel combined with a modern touch we call downtown Fort Worth…ESPN announced on Wednesday, July 23, 2010, from the patio of 8.0 restaurant that “Cowtown” has sealed the deal! Sundance Square in downtown Fort Worth will be the home of ESPN during Super Bowl week, beginning January 31, 2011. According to the Fort Worth Star-Telegram, ESPN’s coverage will encompass 80 hours of television worldwide, in addition to local and nationally syndicated ESPN radio shows. Also, ESPN the Magazine will host its annual Super Bowl party in Fort Worth. Wednesday, July 21st, 2010 at 10:39am. Spire Realty Group plans to develop a six-building office, hotel, retail and parking complex on 12 acres in the northeast section of downtown Dallas next to the Arts District. The initial phase of the project, called The Spire, will include a 21-story office building with about 360,000 square feet of office space, 25,000 square feet of retail and 36 residential units. Caleb Smith, president of Dallas-based Spire Realty Group LP, said The Spire will be a vibrant, pedestrian-friendly neighborhood that "not only allows for interaction with the surrounding cultural destinations, but promotes retail and commercial viability."